This is the third post in a series from Bailey Ryan of wholekitchensink.com. 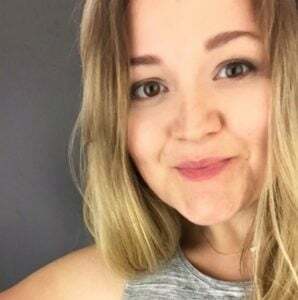 Bailey is a Whole30’er who changed her life and experienced tons of non-scale victories (and significant weight loss), all while working 12-hour, overnight nursing shifts. 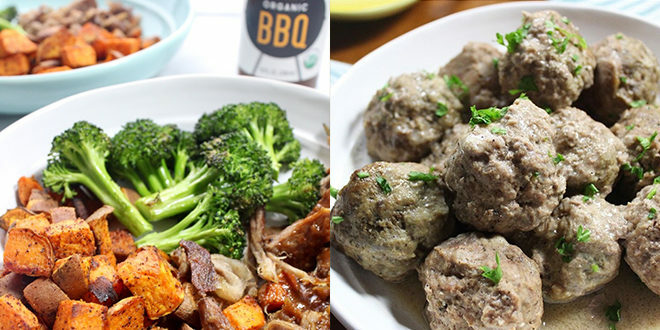 In this series, she’ll share her story and the strategies that helped her succeed with Whole30 and develop her food freedom. It’s been said before, but I think it’s worth saying again: meal prepping is NOT something you can skip while doing a Whole30. That is doubly true when it comes to doing a Whole30 while working overnight shifts. Meal prepping and being prepared is directly correlated to your success when it comes to sticking to your Whole30 while working through the night. Today, I’ll explain my meal prep strategy and give you one more bonus tip for staying on track during those overnights at work. 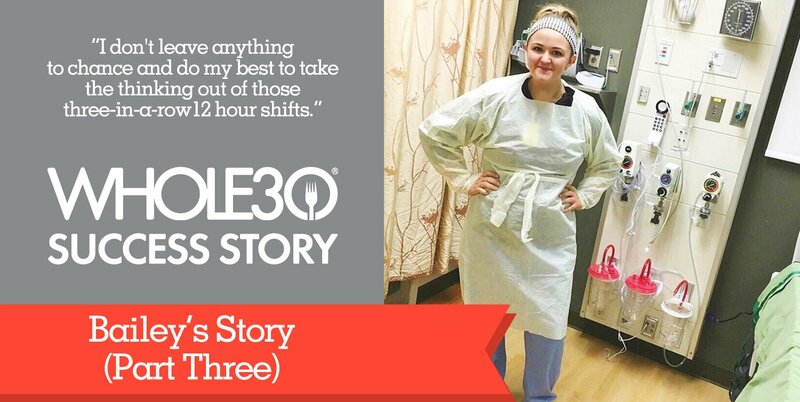 Part 3 of our #Whole30 on the night shift series with Bailey Ryan! I don’t leave anything to chance and do my best to take the thinking out of those three-in-a-row 12 hour shifts. I do an extensive meal prep the day before my shifts start. My goal is to be fully prepared by the day I start working. This means that if I start my stretch of night shifts on Friday, I will meal prep on Thursday. If I can’t get meals prepped the day before, I will at least make a plan and grocery shop. That way I have everything I need to prepare meals on the day my shifts start. By “extensive meal prep” I’m not referring to the time I spend in the kitchen. 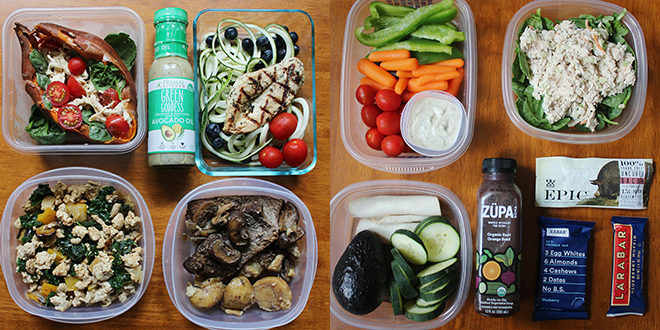 I’m talking about the amount of food I prepare… I get everything I could possibly need ready to go. I make the meals I will eat on the day my night shift starts (this includes breakfast and lunch before work) and prepare or set out all of the snacks I’ll bring with me to work. My meals for overnight shifts are never fancy, Pinterest worthy or require 25 ingredients. But I still manage to make them something I know I’ll enjoy eating. I’ve learned that putting too much time and effort into making complicated dishes is time and effort that is best spent elsewhere, especially if you’re new to Whole30. Make fun recipes and switch things up, but be sure they won’t require 3 hours in the kitchen before your shift starts. Experiment with new meals on your days off and incorporate them into an overnight meal prep once you know that they fit your time budget for meal prepping. Being prepared for overnight shifts usually includes prepping a few different staples and 2 or 3 big recipes that I can divide into a few servings each. I’ve found that having a bunch of staple items on hand allows me to create a few different meals, sides or use them as snacks throughout my shifts. This is usually enough food for the day my shifts start, all the way through my first day off. I know I’ll have to go grocery shopping after my work days end, but I try to have at least one meal prepared for the day after my string of shifts are over. There’s really nothing worse than waking up in the afternoon after your last shift and finding your fridge empty or with just ingredients that you have to, you know, actually cook. If I was going to fall off the Whole30 wagon, I know that is the time I’m most likely to do it. Now, I plan and prepare for it. This tip is simple, yet has been essential for my Whole30 success: avoid eating in the break room. On Day 5 of my very first Whole30 the charge nurse ordered pizza for everyone. I had never turned down pizza in my life. Even though I was committed to Whole30 success, it was hard to sit in that room alone with 12 large pizzas. Then I realized: I don’t have to do this. Now I put my blinders up when I walk into the break room to grab my food out of the fridge. Then I go find a quiet place in the hospital to eat. Sitting in a room surrounded by food you’re choosing not to eat is an unnecessary way to make your life harder. I know it’s not always an option, but when possible, try to take your thoughtfully-prepared meal out of the break room, especially when there’s food from a pizza party, going away celebration, or potluck in there. That doesn’t mean you have to isolate yourself. Bring in something healthy for your overnight crew to nosh on or suggest a healthy potluck. Get others on board, tell them about the Whole30 (they’ll be asking about it anyway, bring a copy of The Whole30 to work to make answering their questions a bit easier) and do it together. I did a few Whole30s with some of my best friends; it made it more fun and eased up some of the pressure I felt from other coworkers when I was working. Doing a Whole30 while working the overnight shift isn’t the easiest thing ever, but like Whole30 Headmistress Melissa Hartwig wrote, it’s not that hard either. With a little preparation, planning and dedication you’ll be well on your way to flying through a night shift with ease. Bailey spent the last 2 years changing her relationship with food and herself. She lost 120 pounds while working 12 hour overnight shifts in a Minneapolis hospital and is now living a “whole” new life. 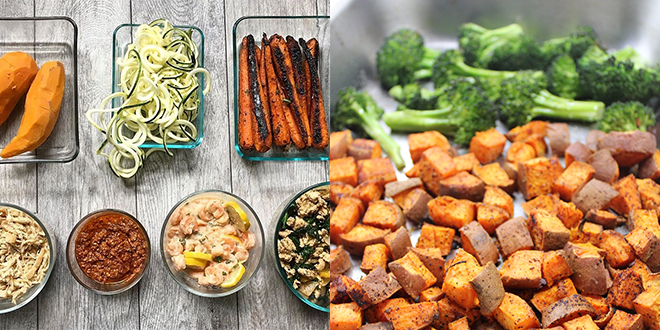 She shares it all on her Instagram, @paleobailey and writes about healthy living, easy yet delicious recipes, Whole30 and the ups and downs as she navigates finding overall wellness on her blog wholekitchensink.com.